Is Marketing a Good Career for your Future? The versatility of the marketing industry cannot be denied. When you have a marketing degree, the options are virtually endless. Every company, regardless of its industry, has a need for a marketing team or specialist and these positions are quickly becoming top-priority with many industry leaders. With a degree in marketing, you're not limited to working in a particular field. There are so many companies all around the world who are in need of educated marketing specialists and the variety of jobs is endless. The course curriculum for most college marketing programs revolves around the generic concepts involved in the industry. From public relations to consumer research, many of the fields covered when going for this major will pertain to any marketing job you might find after graduating. 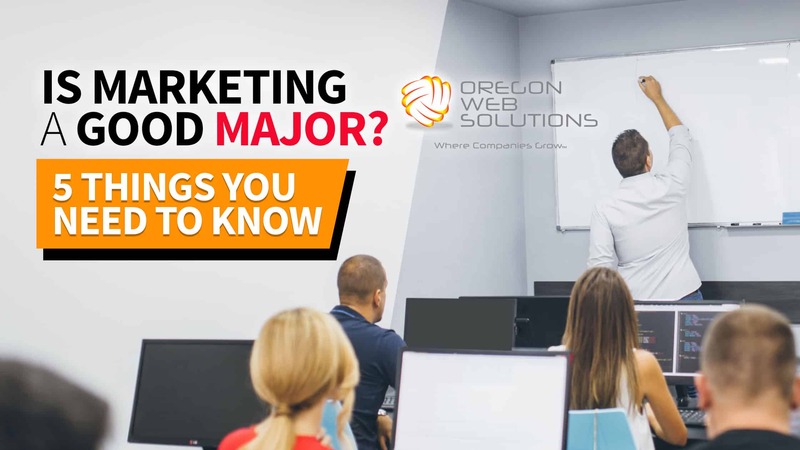 The essential information you'll learn in the fields of advertising, marketing communications and strategies, sales, and management will provide a strong foundation for your post-graduation job. Of course, the potential classes offered will depend on the college, but most will apply at least a generic version of these courses. Is Marketing a Bad Major? There are a lot of fears surrounding many occupations, rendering the thought of obtaining a degree in those fields an obsolete idea. Could this be the case with a marketing degree? The ability to write well. Can differentiate between goals, strategies, and tactics. Basic understanding of social media algorithms and SEO compliance. Keeps up with social trends. Understands data science and interprets consumer data accurately. What makes you happy? Basically, what do you find exciting and consistently interesting? A passing hobby is all well and good, but when you're choosing your college major, how you decide will determine the path your life will take. If you choose based on how much money you think you will be able to make, rather than going with a field you find interesting, you run the risk of winding up with a lower-paying job than you expected, doing work you don't even enjoy. That's no life for anyone. So, please, be careful and considerate of your future when making this most important selection. Determine where your skills lie, what you're naturally drawn to, and find the right balance of enjoyment and occupational success for your life. Set a desired net worth or annual income. While you'll want to choose a major based on your personal interests, it is important to keep in mind how much you might be able to make in that industry. For the best balance of potential income and general job contentment, make a list of at least three possible majors and understand the pros and cons of each before making your final decision. Which college best suits your future plans? If you're looking into a specific field, such as marketing, some schools may specialize in your chosen field. Choosing the right college is just as important as choosing the right major. Make a list of everything you'd like to get out of your courses and compare and contrasts colleges which offer those key concepts. In today's technologically advanced world, the field of computer science is continuously blossoming. Choosing this as your major will land you jobs like software developer, computer programmer, or a systems analyst, among many others. Common skillsets for people occupied in this field are critical thinking and analytical skills, strategic thinking, time management, and web design skills. Those who major in business will find themselves at an immediate advantage. This major has been one of the most popular, providing people with occupations such as accountants, financial analysts, management consultants and many more. A practical mind and strong organizational skills are key to success in this field. Understanding the way the human mind works has been a draw to theorists and philosophists, dreamers, and thinkers for eons. When you choose to major in psychology, you'll join the field of great theologians and philosophers such as Plato, Tversky, and René Descartes. Those who choose this field for their major typically have an inherent desire to obtain a deeper understanding of the human psyche and are not easily overwhelmed by convoluted texts and statistical data analysis. Many who choose this as their major will look forward to learning about the molecular structures of bioorganisms and how to modify and/or incorporate them in various ways. A strong background in chemical science and biology is likely to lead one to pick chemical engineering as their major. You also need great math skills and an ease of understanding complicated formulas to be successful in this field. All of these majors and more are viable options for any who deem themselves fit for their chosen industry. Of course, taking the potential average salary for each possible major will play a large role in your overall decision. There is an over-abundance of information available on the web, and it can get a bit daunting at times. That's when you fall back to what you know. Understanding what your strengths and weakness are and what makes you truly happy in an occupational setting will be the key to your future success. It's easy to underestimate the importance of having an element of enjoyment in your career. After all, it's called a ‘job', right? Of course, we all have a job to do, and it's not always going to be the most fun thing in the world. Which is why choosing a career path that's in line with your hobbies and natural skill set is so crucial to the overall quality of your life. Is marketing a good major? In the end, it is up to you to decide. We use marketing all day every day. If you were to personally ask me “is marketing a good major?” I would say absolutely if you are going to use it in the digital market. Everything happens through the web and it is only growing. Old school marketing can still work, but online marketing is where it is at. That is the trick, there is no required degree for online marketing. There are training course and suggesting reading and studying I would do, but you don't need a degree. Some of our best hires don't have any kind of college degree at all. I'm not saying having a marketing degree wouldn't help, but it is not required. It would look good however for an employer to see. It just shows that you are dedicated and can follow through. Thank you for reading our article on “is marketing a good major”. If you are looking into online marking be sure to reach out to us and ask what kind of required training we might suggest to assist in your future career or marketing major. There are never enough good marketers out there, so we hope you will be the next! Is Marketing A Good Major? 5 Things You Need To Know	Overall rating:	5	out of 5 based on 48	reviews.